Microsoft is now all set to make the rapidly increasing online information more user-friendly and accessible with a new personalized search engine – Emporia. A team of five scientists have been working in Cambridge to develop a search engine that is intelligent enough to learn and provide search results based on individual needs. Ralf Herbrich, a Microsoft manager, recently announced the developments at the Next11 conference in Berlin, he even brought along a prototype to demonstrate. Microsoft hopes to make the rapidly growing flood of information online more user-friendly and accessible with its new personalised search engine, Emporia. To tell whether an item is relevant for a user, the Emporia project also analyses data from posts on social networking sites like Twitter and Facebook. Knowledge and concrete experience from these networks is growing ever more important, says Herbrich. The first prototype of Project Emporia is ready for mobile use on Microsoft’s Windows Phone 7 and is already one of the top 10 apps on Microsoft’s Marketplace. 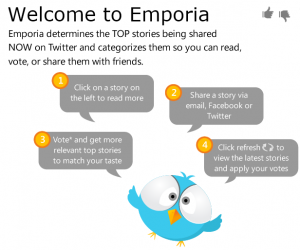 Emporia provides results by analyzing news streams, searching for keywords and key categories and filtering for interesting stories. Users can refine the results by following certain people of websites. Personalized appraisals are expected to result in data that is more relevant to an individual’s personal interests. Domain name industry has been blooming ever since it started. This quarter had four and half million domain names added o the Internet. The data came from the latest Domain Name Industry Brief published by VeriSign, Inc.
First quarter of 2011 had more than 209.8 million domain name registrations across all TLD’s which is 2.2 percent higher than the last quarter of 2010. Verisign’s combined base of .com and .net domain names experienced aggregate growth in the first quarter of 2011, surpassing a total of 108 million names. New .com and .net registrations totaled 8.3 million during the first quarter. The total represents a 9.2 percent increase year over year in new registrations, and a 2.7 percent increase from the fourth quarter. The .com/.net renewal rate for the first quarter was 73.8 percent, up from 72.7 percent from the fourth quarter. The base of Country Code Top Level Domains (ccTLDs) was 81.7 million domain names, a 2.1 percent increase quarter over quarter, and a 5.1 percent increase year over year. Verisign’s average daily Domain Name System (DNS) query load during the quarter was 57 billion, with a peak of 67 billion. Compared to the same timeframe in 2010, the daily average and the peak each grew 6 percent. With all these domain names, the risk of DDoS attacks and the risk of hacking increases a lot. It is always advisable to keep your domains safe from such attacks. VeriSign provides services and is undertaking measures to make the domain owners of techniques to prevent themselves from fraud. Google Adsense allows domain owners to pick templates for domains. 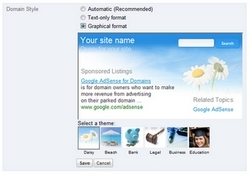 Google Adsense for Domains’ self-service system now allows users to select a template for their domain names. The service has been testing templates with various pictures for many months, but until now users didn’t have control over which templates were selected. Currently, Google only has 6 generic types of available templates, Daisy, Beach, Bank, Legal, Business and Education. You also have an option of selecting text only format for the landing page, although Google recommends that you let Google decide which type of template works best for your domain. Google is finally trying to catch up with the established domain parking brands such as SEDO who have 100’s of templates to offer to their clients. 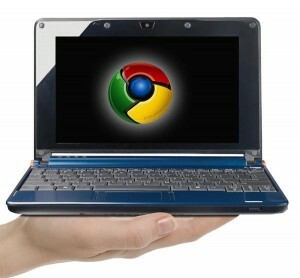 But still its a first step by Google, hopefully we should be able to see more templates in time to come. Africa is going to have its very first Internet and digital marketing event, Afri-Tech. The event expects to bring marketing gurus from around UK, USA, Asia and Africa. The event will be held in Nairobi, Kenya and will last four days from June 15-18. According to the CEO of Afri-Tech, Bernard Sanganza, all the speakers that have confirmed the participation are likely to be graced by the Kenya’s President, Mwai Kibaki. “We are just waiting for the big day in Nairobi as marketing gurus converge to discuss the way forward on digital marketing,” Mr Sanganza said. The chief executive officer said the realisation of “Africa’s dream” is finally coming to fruition, with significant support already confirmed from leading corporate firms in Africa, the Government of Kenya as well as universities. While the works involved have been hectic and bureaucratic, marketing experts argue that the conference will significantly shape the future of products and services sales globally. “The development will see firms learn from marketing experts around the world. This will obviously impact positively on companies’ output,” Mr Ital Chando, the firm’s head of marketing said. Only three weeks ago, Afri-Tech hosted a curtain-raiser event at the Kenyatta International Conference Center that was well attended by industry leaders across East Africa. Catherine Ngahu, the chairman of the Kenya ICT Board, lauded the June meeting, arguing that Africa can only come out of the perennial problems of poverty when the continent embraces modern technology. “This was a well thought-out meeting for digital marketing. Indeed through such a platform, firms can reach millions of clients within the touch of a button. ICT board is ready to host Afri-Tech, and provide all the support it will need,” Ms Ngahu said. The four day conference will be a hub for mass of new knowledge and new contacts. This will be a very good platform for the growth of digital marketing in Africa. The latest survey by Adobe has come called “Adobe Scene7 2011 Survey: Digital Marketing in the Next Decade”. This is Adobe’s fifth annual quantitative study to identify various online enhancements the marketers are investing in to provide better customer experience and to improve conversions. 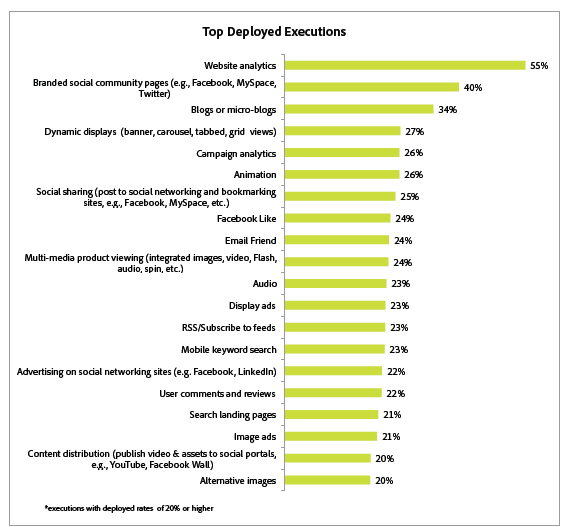 Different businesses worldwide were asked to mark the executions that they currently deploy to propose to deploy in future in categories including analytics, digital advertising, mobile, personalization, rich media and merchandising, and social media. They were even asked to vote on how they deployments were impacting their conversion ratio. This year the survey measured a total of 109 tactics. A record number of 1,941 respondents participated in the survey, more than triple of last year’s. 73% of the businesses surveyed said that they plan to invest in website redesign or make some enhancements to improve their website ROI. 82% of them planned to make these changes within this year. The most deployed tactics globally are analytics, social media and rich media/merchandising, whereas mobileapps, social executions and rich media are among the top planned. The most deployed tactic used globally is Analytics tools for measuring and optimizing website experiences. This is used by 55% of the survey participants. Mobile cracks the top planned deployments for the first time since the survey first began measuring its executions in 2009, suggesting the channel is finally finding its audience after years of hype. This year, iPhone apps are the most planned deployment, cited by 27% of the respondents. It shares the top spot withinteractive catalogs, which leads planned deployments for the second year in a row. Just behind are iPad apps, advertising on social networking sites and branded social community pages, each cited by 25% of therespondents. Among the low single digit deployments, mobile has the highest planned execution rates. This is mostly true for Android smartphones and tablet apps. With a 4% deployment rate for Androidsmartphone apps, and 3% for Android tablets, their planned deployments are a respective 23% and 18%.Other planned mobile executions with planned rates around 20% include mobile-optimized websites and interactive catalogs. Most of the women use web to share content, their experiences and in marketing words, for spreading word-of-mouth. Some key influencer groups rely more on online communication than any other medium. Some even use social networking sites as a major communication tool to spread the word about the brands. AOL and Bovitz Research Group categorized the online female population down into several segments based on their values, habits and characteristics. The research suggested that the smallest groups were the most active online and contributed the most to online word-of-mouth. social expressionistas that make up 8% of the total online female population, most likely use Internet as a way to express their views and they prefer to interact with people similar to them. Some other groups are shosessives (7%), businesswireds (15%) and alpha trendsetters (13%), prefer to spread the word around brands more, but they are less likely to do it on web. Social expressionistas’ love of spreading the word online is very much related to their love of social networking sites. Nearly nine in 10 social expressionistas said social networks were their favorite type of site, 13 percentage points above the next group, alpha trendsetters. As per the report, the best way for marketers to encourage buzz among social expressionistas is to make them part of a dialogue and give them the opportunity to play with brand assets and use them to create their own content. Alpha trendsetters participate less in online discussions, but they prefer to spread the word about brands, and be the first ones to know about it. Thus, the best strategy for this group would be to give them early access to new items, like sneak peaks. Well, this study clearly tells a lot about the digital marketing strategies to be used while targeting online female population. Hope marketers can get some use out of it.